A group of journalists from Turkey's official Anadolu Agency (AA) visited the western Chinese region of Xinjiang, also known as East Turkestan, which has made the agenda of Turkey due to the alleged heavy oppression of the Uighur population by the Chinese government. Uighurs are a mostly Muslim Turkic-speaking minority in northwestern China. The Chinese government is accused of restricting religious freedom and freedom of speech in Xinjiang, home to millions of Uighurs. It is claimed that the government has banned fasting during Ramadan, wearing a head scarf in public and praying in public and forces Uighurs to stop practicing both their religion and culture. Yet AA journalists reported that despite certain problems, it is not on the agenda of the Chinese government to ban Islam totally. People can pray in the region's mosques and fast during Ramadan. However, Beijing has been accused by several rights groups of discrimination. Human rights groups, including Amnesty International and Human Rights Watch, have frequently reported that Beijing restricts religious freedom and ethnic liberties as well as basic human rights in the country's ethno-religious minority regions. "In the Xinjiang Uighur Autonomous Region, the authorities stepped up already harsh restrictions on Islam with the stated aim of fighting "violent terrorism and religious extremism." Numerous counties have posted notices on their websites stating that students should not be permitted to fast during Ramadan, and many teachers gave food and sweets to children to ensure that they did not observe the fast, Amnesty International said in its 2014-2015 Human Rights Report regarding religious freedom in China. 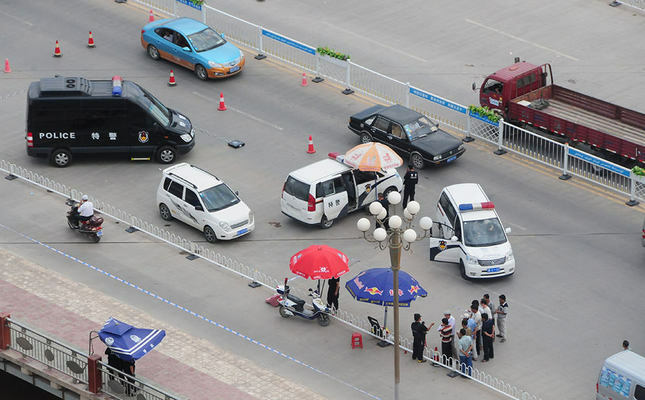 AA reporters said that after new measures were taken by the Chinese government against terror at the beginning of this year, security has been increased across the country. However, it has increased more in Xinjiang. "The heavy security measures are part of daily life. Armed security forces guard many corners. It is not possible to freely take a photo due to the security forces. Moreover, people are also hesitant to be in photos or videos," the AA journalists said. In response to claims that the government banned young people from entering mosques or having beards, the reporters said: "In the mosques, people, some of whom have a beards, pray with their children. Yet the relatively free atmosphere collapses when Uighurs refuse to obey the rules that restrict some religious activities. According to the reporters, there are posters in the streets that warn Muslims of what to and what not to do. "For instance, the posters remind people that religious marriage and divorce are prohibited [in China]. Moreover, it is written that teaching the Quran or how to pray or fast to teenagers and students is prohibited. Opening courses to teach the Quran without the permission of the government is also prohibited," they said. The AA reporters also added that the government places ads everywhere defining who is a terrorist. The AA journalists said they experienced from people's reluctance to talk about critical issues. Fear may be playing a role as well. For instance, some residents told AA there is no problem for Uighurs to fast who work for private organizations or companies, but "some told us someone working for the government sometimes faces problems." On the contrary to an optimistic approach, Uighur leaders in exile say the people are oppressed and whoever attempts to speak out disappears. World Uyghur Congress (WUC) President Rebiya Kadeer, who was previously forced to flee Xinjiang to the U.S., recently spoke in a video message at the Turkic World Issues and East Turkestan conference in which she accused China of being a "terrorist" state. "The Chinese government has imprisoned youth and those under the age of 35. More than 40,000 administrative people from the Uighur community have been imprisoned," Kadeer said. She also accused Beijing of waging an "unnamed war against Muslims and Islam." "Unfortunately, the world is still keeping silent," WUC Vice President Seyit Tümtürk said. "China's goal in prohibiting fasting is to forcibly move Uighurs away from their Muslim culture during Ramadan. Policies that prohibit religious fasting are a provocation and will only lead to instability and conflict," WUC spokesman Dilxat Rexit said.